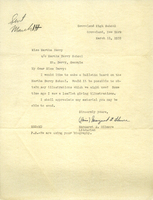 In this letter Margaret Gilmore says that she would like to make a bulletin board on the Martha Berry School and asks Martha Berry for illustrations to use. 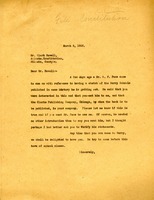 Part of a handwritten letter to Martha Berry pertaining to a small donation given to the Martha Berry Schools. 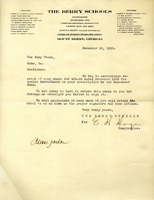 The letter is letting the gentlemen from Fahy Store know that they forgot to sign the check that they sent. The check was for $25.00 to the Endowment Fund.